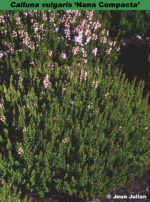 Lavender (H3 flowers, VIII–IX; dark green foliage; low spreading habit; height 10–15cm; spread 31–45cm. Pale lavender (H3) flowers in very small spikes, VIII–IX; bright green foliage; height 10–15cm; spread 31–45cm. The most floriferous of the pin-cushion lings. Named from nanus = dwarf; compactus = compact. White flowers, VIII–IX; dark green foliage; erect; height 31–45cm; spread 46–60cm. Named after the finder's daughter. Pink (H8) flowers, VIII–IX; dark green foliage with orange or red tips to the shoots all the year; height 10–15cm; spread 31–45cm. Wild-collected; found in the Lüneburger Heide Nature Park, Germany, by H. Westermann (Bispingen-Borstel, Lüneberger Heide, Germany); introduced by H. Westermann in 1972. The name comes from that of the park where it was found; in Gartenwelt (9 February 1974) the name is rendered as 'Naturpark 16'. ❁ Rose-pink flowers, VIII–XI; dark green foliage; upright habit. Found by Günther Wollmer (Fuhlendorf, Schleswig-Holstein, Germany) before 1992 and named after his grandmother. Named from "Madchenname a TV series". ® C.2006:10 registered on 31 December 2005 by Kurt Kramer, Edewecht, Germany. Purple-red flowers, VIII–Oct; dark green foliage; broad upright habit; height 31–45cm; spread 46–60cm. Selected from a deliberate cross between 'Darkness' and 'Carmen'; it is named after the raiser's grandchild. ♤ Dark salmon-red buds, IX–XI; dark green foliage; broad upright habit; height 30cm; spread 50cm. Seedling selected by Johannes van Leuwen (Geldern-Lüllingen, Germany) in October 2000. Prone to fungal attack. Registered on 15 December 2002 by Johannes van Leuven. ♤ Bud-flowering (Knospenblüher) H5 (ruby); buds 4mm long, to 1.5mm diameter; IX-XII; foliage dark green, young growth mid-green; habit upright, bushy; height 25cm; spread 30cm after 3 years (pruned). Bud colour redder than ‘Juliane’. Sport on ‘Juliane’ found by Hans-Peter Holz, Weeze, in autumn 2008. ® C.2012:03 registered on 19 February 2012 by K. Kramer, Edewecht-Süddorf, Germany. This name contravenes the ICNCP (1995, Art. 27.3); the original name 'Skone' should be reinstated. NORDLICHT may be deemed a trade designation (Art. 11).